Discovery generally requires one to look behind, beneath or beyond something. Most often that’s more of a mental challenge than a physical one; once you have the motivation, all it takes is the movement of one hand. But there are times when the surface layers are just so thick, so heavy that removing them exceeds the abilities of one person—or even one lifetime. 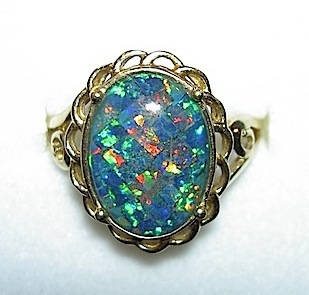 Such was the case with the discoveries once shared with me by an old Mexican opal miner. 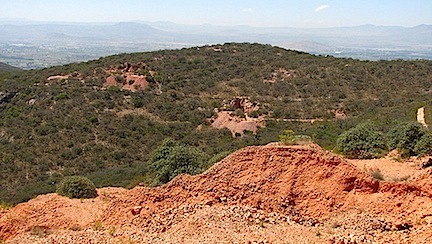 My friend Silverio and I were headed for La Trinidad, a small village near Tequisquiapan, Querétaro, in central Mexico. We wanted to see if we could find one of the opal mines for which this region is—and was even more so in the past—well known. Apparently, Silverio had no plan but to show up and see what would happen. Luckily, the attendant of a gas station along the way had told us to head up into the foothills, find the village and ask around for Héctor Montes, who, he suggested, would “take care of us.” I wondered if there was any way he could have misinterpreted our inquiry about opals as something less innocent. We found the village and asked several more people where we might find Señor Montes. Reconciling their widely divergent directions, we finally arrived at a rather nice home for these parts. Héctor's wife met us at the wrought iron gate, listened to our request and then welcomed us inside where she introduced her son, Fernando. rock poured out of the void. 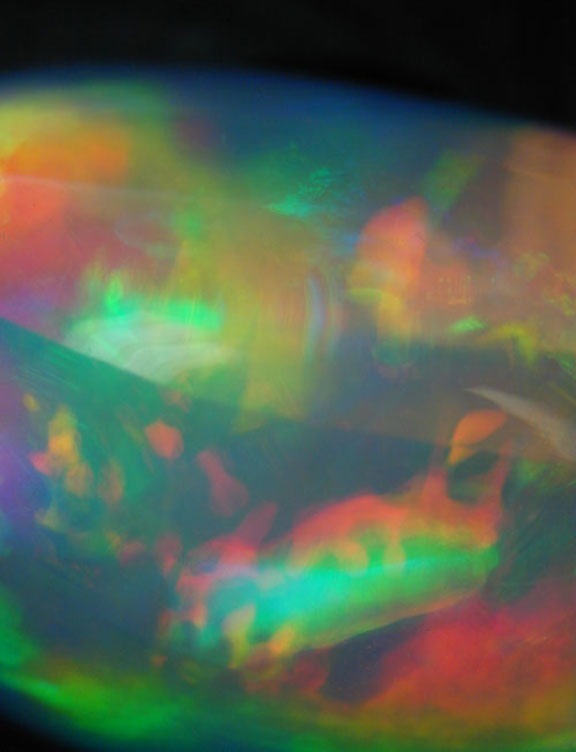 They sat us down at their dining room table and began showing us what we thought was everything one would ever want to know about opals, including a display showing the progression of steps needed to process opal from raw ore to finished, mounted stones. Then Fernando piled us all into his 4x4 camioneta (pickup) and drove us—on a barely navigable road made mostly from the rock talus of old opal mines—up the side of the mountain. On the way, we had a nice conversation with him in Spanish, learning that his dad has been mining opals here for 40 years. We passed several dirty, exhausted-looking miners walking home after their shifts. After a gut-tumbling couple of miles, we arrived at the end of the road. The fabulous view of the surrounding hills was splashed here and there with the golden rock debris of old, tapped-out claims. After climbing on foot another 200 or so vertical feet, we arrived at a big hole sunk vertically into the side of the mountain—about 25 feet deep and 10 feet across. The plink, plink of hammering on rock poured out of the void. I peered over the rim and there at the bottom was a wiry man with skin that matched his well-worn boots. 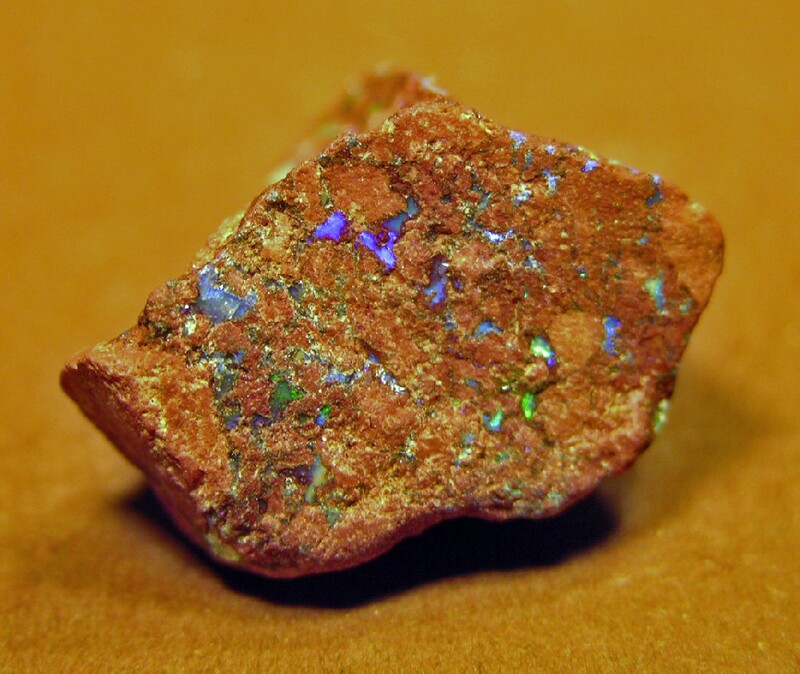 Suddenly there appeared two red beams of light which came together on a fist-sized opal. Like so many Mexicans, Héctor looked at least ten years older than the sixty I figured he really was. Leaving the picking and digging to his young hired hand, he came up the ladder with a half-full bucket of rocks, welcomed us very warmly and started right in on what was to become a full afternoon’s "education" about opals and opal mining. Héctor showed us the different types and colors of veins he'd found that day, took us down to other mines, and explained how—since good veins near the surface are pretty well tapped out—they now have to dig ever deeper to find them. The highlight of the day was our visit to a large and very deep former mine. Once we'd clambered our way well into the cave, beyond the reach of daylight, Héctor pulled several gnarly candle stumps out of his pocket, handed us each one, and lit them. 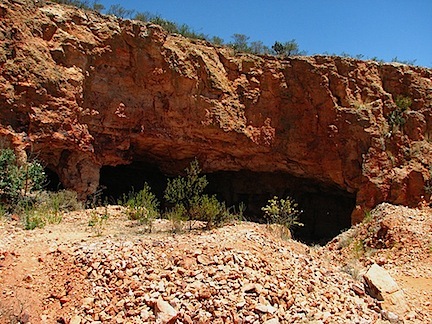 A few minutes later, we reached the terminus of the mine, where he pointed out one of many old fissures in the rock where the opal veins tended to form. There, playing with the candlelight as opals do, winked small remnants of the gemstone considered too small to yield marketable stones. 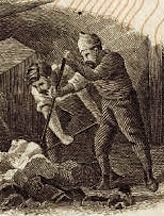 Suddenly, one of the men turned and ran, terrified, out of the mine. The other, his fear dissuaded by greed, failed to notice the slight rumble presaging the collapse of the mine entrance. Neither he nor the great opal was ever seen again. Hundreds of huge bats sliced silently through the damp air just inches from our heads. As Héctor was talking—in clear, mercifully-slow Spanish—I found it hard to concentrate, because odd little puffs of breeze kept ruffling my hair. I didn’t dare put my hand up, already guessing their source. 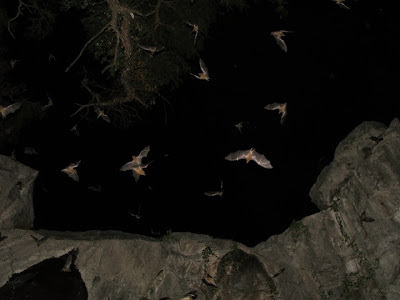 When Héctor finally struck a match to relight our candles, the flickering glow caught the wings of hundreds of huge bats slicing silently through the damp air just inches from our heads. When something seems to come out of hell, and it is then embraced as seen in the beauty of the flight of the bat, the realm of heaven on earth has been achieved. The bats themselves become gems and treasures that get put into the heart collection to take with us wherever we may go. Value then is no longer measured externally, but feels infinite internally through the connection we have with it. Bernie -- I love the parallel you draw between the bats and the opals! So I took with me both the opal I bought from Héctor and the experience -- both gems indeed! TWO AND GROWING – Thank you!